• 4x wooden laths from 122 cm length x 2,5cm. We went for the wooden look, but you can also paint the laths for a fun effect! • 1x round wooden stick from 122 cm x 2 cm. Idea: a copper or black pipe looks cool as well! • Fabric 150 x 220 cm. We chose the Poly Outdoor Fabric from Motiflow. This is a beautiful, firm, water-resistant fabric. So after playing a day outside you don't have to pull the tent back in your house. With the fabrics from Motiflow you can choose between 50, 100 and 150 cm width. So you can order just what you need! • A speed drill, don't forget to measure if you have the right size for the stick. In our case we needed a 2 centimeter speed drill! Mark the laths. On every lath, mark a dot with a pencil, about 15 cm from the top of the laths. Here you are going to drill with the speed drill. Drill a hole in every marked dot. Make sure you use the right size of speed drill, by checking it in the meantime with the stick. Make sure the holes are not to big, so you can make a stable frame. Put the frame together. You do this by putting the laths in diagonal position, and than you put the stick trough the first two holes you made. Ask someone to help you, that will make it much easier. Than also pull the stick trough the other two laths, en than your framework is done! Because the fabric frays a little, we advise to flank it. Of course this also looks way better! Pin the fabric about 1 centimeter on both sides. To apply the tent-cloth you need to add elastic to the corners. Pin the elastic on the corns of your tent-cloth and sew it. 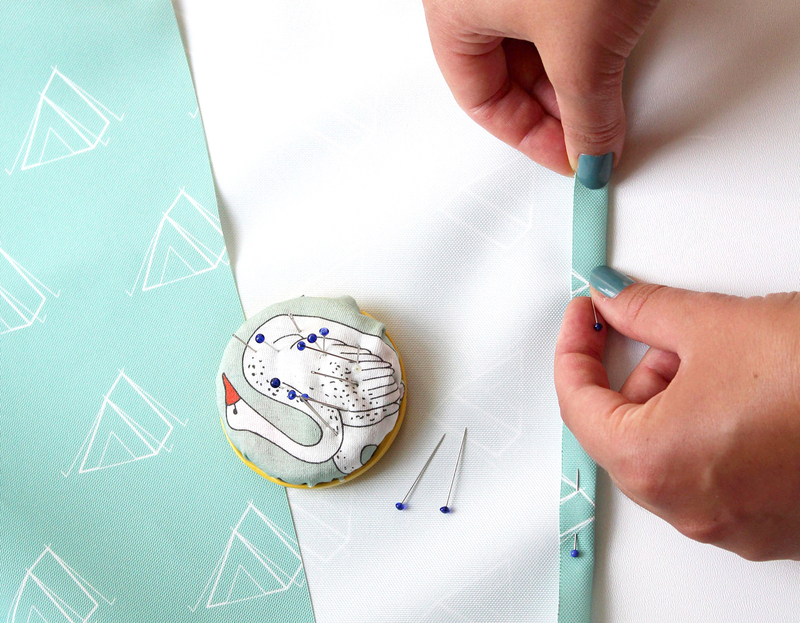 Make sure you sew it about two or three times, you don't want the elastic to come off! After you applied the elastic to all corners, your tent-cloth is done! The only thing you need to do is strap it. Lay it over the frame and pull the elastic around the laths to make it stay in one place. Voila, your selfmade tent is done! Time to go camping.. Who's bringing the frankfurters? We were super enthusiastic about the tents-pattern from Studio Maas. At Motiflow you can find many more awesome prints that you can all order on fabric. Flowers, leaves, a jungle print.. or even a campingpattern. But keep in mind that when you lay the tent-cloth over the frame, the pattern will be up side down on one side. So, we suddenly had all camping tents rolled over! But no worries, it's easy to solve. Just cut the fabric in half. Measure this from the frame and cut the fabric in half on top of the stick, with 1 cm extra so you can flank it. Pin both pieces of fabric from the outside on each other. Make sure you mirror the fabric! Sew it on each other and than turn the fabric around again. Now you have your print the way it is meant to be on both sides. Want to make this tent? This month you can win two meter of Poly Outdoor fabric with the #motiflowfavourite give away. Wanna join? Check it out! Are you going to make this tent? Than share your photo with #diymotiflow, so we can like, share ane admire your creations!